I recently picked up another Thing statue, this one from the Corgi company. I had seen this around a few times, but it was never on my "must buy" list until I saw it for a great price. This statue came out in 2006, when Marvel was starting to roll out its more generic branding with stock art. The side of the box is the Thing's chest, though, which is pretty cool. Here's the front of the box, with an image of what's inside. The statue itself it pretty heavy for its size. The base is made of metal and is quite hefty. I got #1453 out of a run of 2500. And here's the back. The pants the Thing is wearing are similar to his appearances in the Ultimate Fantastic Four title, which debuted around this time. It's a nice, if not unremarkable statue. I'm glad that I finally grabbed it after looking at it online for years. 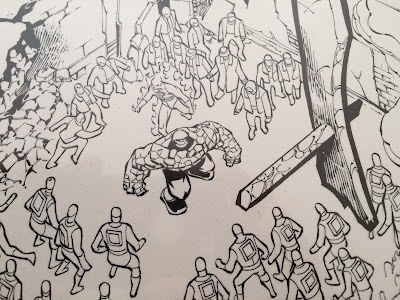 While we're here, why not have a quick Local Comic Shop Day recap? I spent a few hours at Pittsburgh Comics on the day of the event and signed a few books. Some people even got a (very rare) Sandwich Edition copy! Lucky ducks. 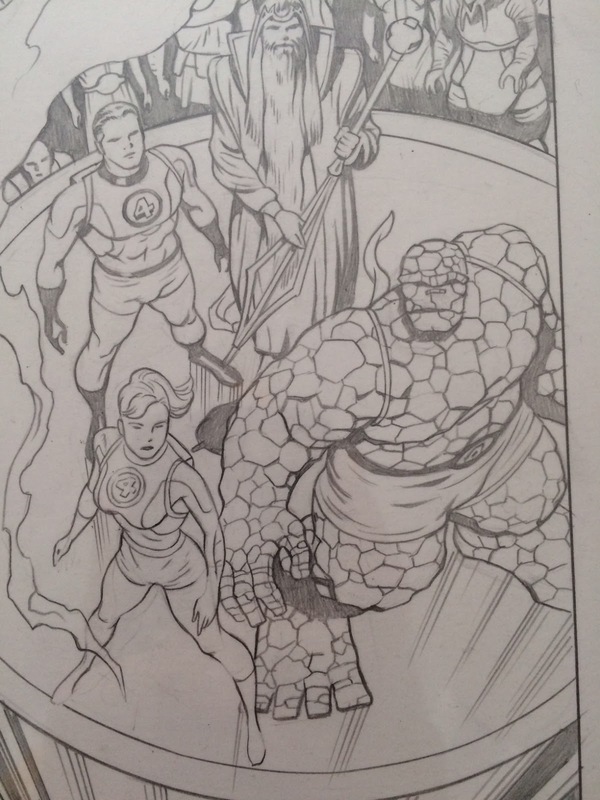 Extra big Fantastic Four news: I walked out of the store on this day with a copy of Fantastic Four #11! (I paid for it.) This issue has the first appearance of the Impossible Man, and is now the earliest issue of the series that I own. The issue is in good shape and I'm thrilled to have it. And lastly, artist Tony Sedani sent me this great Thing pinup a few days ago! 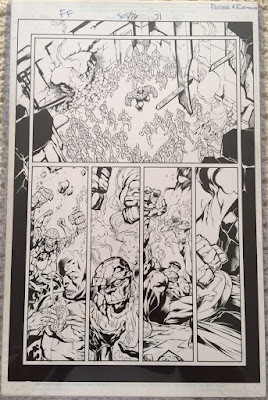 Tony has drawn a few pages in recent issues of The Tick, and I was surprised to get this in the mail. What a cool piece! Into the collection it goes. Thanks, Tony! There's a new issue of The Tick coming out this Saturday, 11/19, for Local Comic Shop Day! LCSD is in its second year and is designed to promote comic shops with physical locations (so the books aren't available at online retailers). 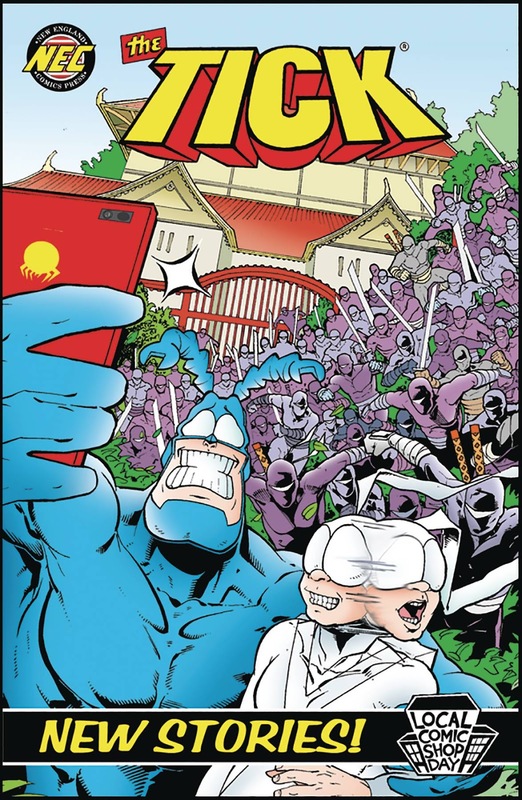 The Tick is the first book with all-new material. I wrote the main story in this issue with Duane Redhead once again on art. 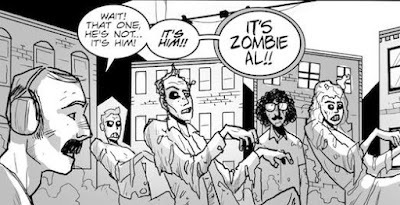 There's also a backup story from a new Boston-area creative team. This is the first issue in stores since the new Amazon show aired, so I hope that the reception is good. If you're in the Pittsburgh area, I'll be signing some copies of the book (and basically anything else) at Pittsburgh Comics on Saturday from 1:00-3:30. This is the first time I've been in Pittsburgh on the day of a release - I'm usually in Boston for FCBD and in San Diego for the Comic-Con specials, so I'm happy to, for once, just get to roll out of bed in the morning and wander into the comic shop without having to plan a trip around it. Check out localcomicshopday.com for more details on the event and pittsburghcomics.com for location information on the store! Hi, everyone. Here are some more pictures from this year's New York Comic Con, taken on the Saturday of the show. I've probably seen more group costumes at NYCC than any other show. I wonder why that is? Anyway, here's a pretty neat Game of Thrones smattering. Adult Swim had a glass-lined cubicle set up on the show floor where they were streaming video to their website. You could wait in line to be on the program for a few minutes. I wonder how many people swore just to see if you could. Here's a really nice costume from the He-Man cartoon and...wait, is that guy wearing a Steelers jersey in the background? Good for you, guy. I guess these people beat up Batman. Fair enough. Here's a view of the mass of humanity at the show. Those hallways fill up very quickly and very tightly. There were two great Lex Luthor costumes that I saw at this show. This battle suit is great! This lady was born to dress up as Barb. Very well done. I got on the escalator to get to the main hall and found that I was right behind "Walking Dead" co-creator Robert Kirkman. I'm pretty sure the only reason I was able to get a picture with him is because neither of us was going anywhere for half a minute. I'm fairly sure all of these Spider-people came to the show separately and then were drawn together when they saw the elaborate Carnage. Here are some folks as the TV-show inspired Flash and Professor Zoom. I've actually seen a few Ant-Man costumes lately. It doesn't look like a very easy costume to make, so that's surprising to me. I chased these MST3K fans down for about three minutes before I could get close enough to take this picture. Okay, this guy is dressed up like every Johnny Depp character (or a lot of them, anyway). I thought this was a really unique outfit, but Larry tells me that he's seen it before. I got a picture with this Thing last year, and I had seen the Invisible Woman then as well. But this year the whole gang got together. Great to see a Fantastic Four group costume at the show! And then I saw someone else dressed up as Mr. Fantastic! Crazy! I caught up to Dana Snyder - Master Shake on Aqua Teen Hunger Force - in artist alley. He shouted right as the camera took the picture. I'm pretty happy with how this turned out. I'll never get tires of seeing Chairface Chippendale costumes. I love that this is an issue specific Mr. Fantastic. 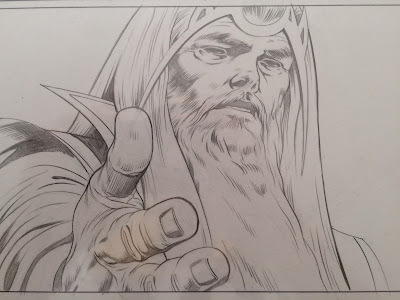 The costume (and the beard) are from the Hickman run on the book. Someone dressed up as the Comedy Bang! Bang! mascot! We even exchanged show quotes. Shameful fact about your old pal Jeff: I've never watched The Sopranos. I know that I should fix this and I plan to one day. Here I am with Matt Servitto, who I knew because I was an extra a few times on the show "Banshee", where he plays a small town sheriff, and I remember seeing him there. We talked a little bit about the show and Pittsburgh in general. He's probably best known for his role on Sopranos, which I found out soon after. This whole family was dressed in their Starfleet uniforms. Interestingly enough, Run DMC had a table in artist alley. I was walking past the Stan Lee Collectibles booth, and I thought to myself, "Oh, I wonder if Stan Lee ever comes here". I then thought that was a stupid idea, because what would he do there? Sell merchandise? Then I looked to my right and I saw Stan Lee. It was at this time that everyone else in a 30-foot radius also noticed him, and chaos ensued. A huge crowd gathered and he left soon after. Here's a picture of a guy getting a picture of himself near Stan Lee. And here's Stan Lee, pretending not to notice the masses gathering around him. Everyone was very excited, but thankfully no fathers of modern comics were trampled. And here's the last group shot of the show, near closing time. Lookit all of these '90s-era X-Men! I think I see Marrow in the back. That Bishop is rockin' it pretty hard. 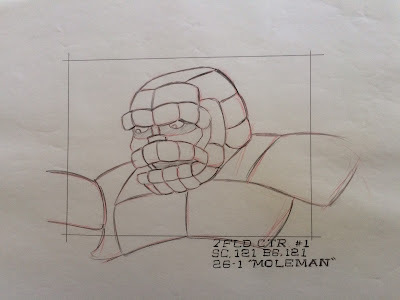 New Fantastic Four original comic and cartoon art! Every year at the New York Comic Con, you can find a massive display of original art for sale near the entrance to artist alley. The art ranges from fairly cheap to sell-your-house expensive, and I tend to browse the lower end of the scale. 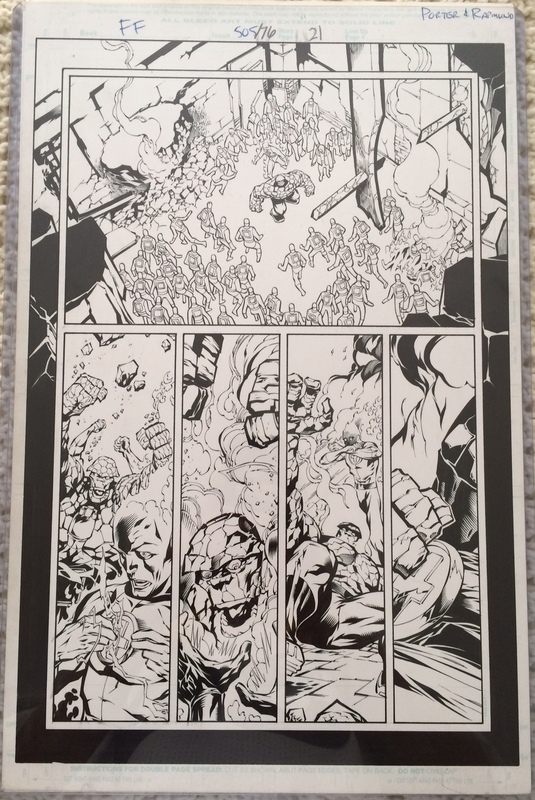 But I've been able to find some deals on nice pieces over the last few conventions, and this year brought in two pages. 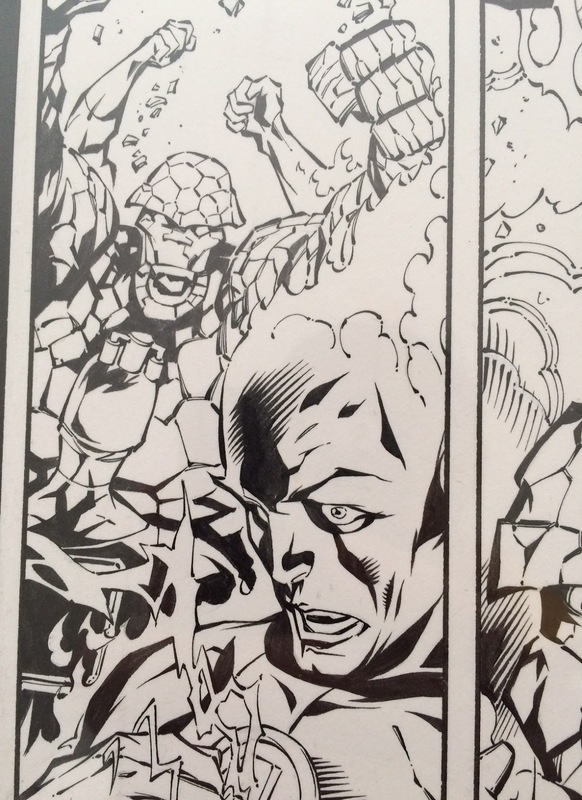 The first is from Fantastic Four #505, where the FF invade Latveria to set up another epic Reed/Doom showdown. At the end of this storyline, the Thing literally goes to Heaven. This page features some nice images of the Thing and the Human Torch as they break up some Doombots. The art is by Howard Porter, with inks from Norm Rapmund. 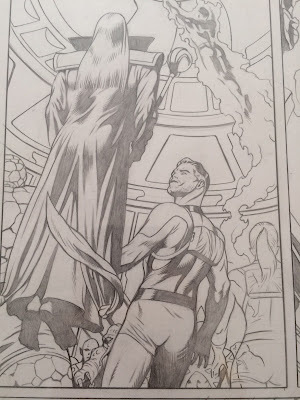 Porter was filling in for Mike Wieringo during his run with writer Mark Waid. At some point in this story, Dr. Doom takes possession of the Thing's body and uses it to do what we'd all do in that situation, beat a lot of stuff up. The ol' belt buckle communicator. 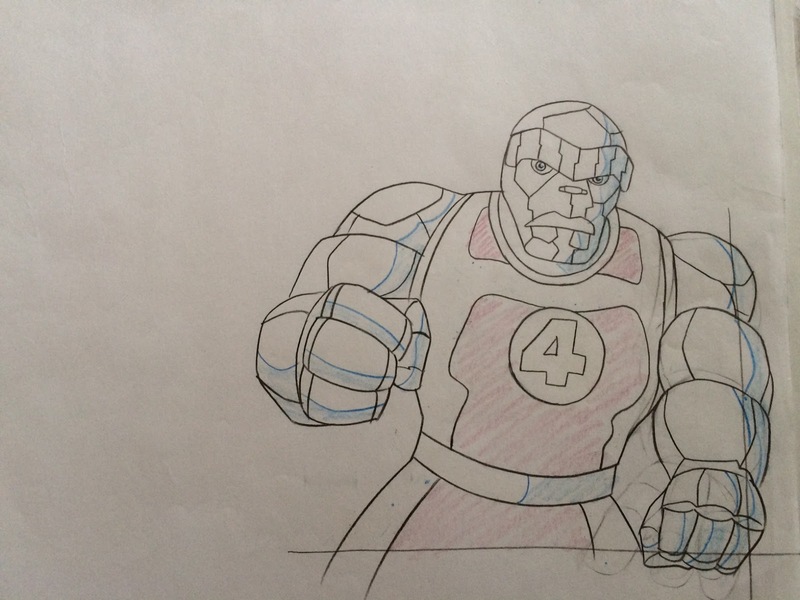 I don't think the Thing needs the "4" symbol on his costume, but at least it was functional here. 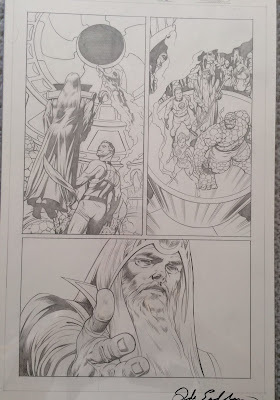 The next page I grabbed (and paid for) is from the more recent Hickman/Eaglesham run, featuring the Council of Reeds, which included, you know, a whole lot of alternate reality Reed Richardses. 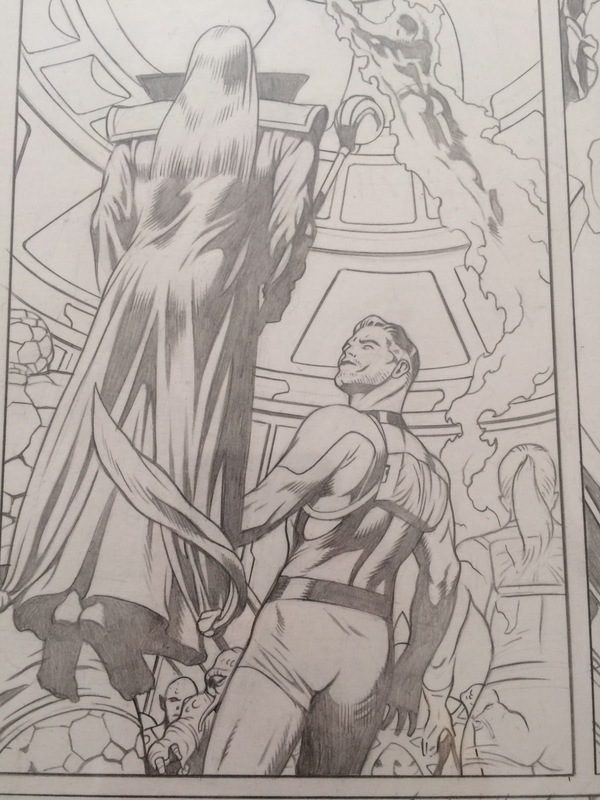 I'm a little surprised at how tight Dale Eaglesham's pencils are on this page. I'm not certain if he had an inker on the issues he drew or not. This page has all four characters together, which is not always easy to find in original artwork. 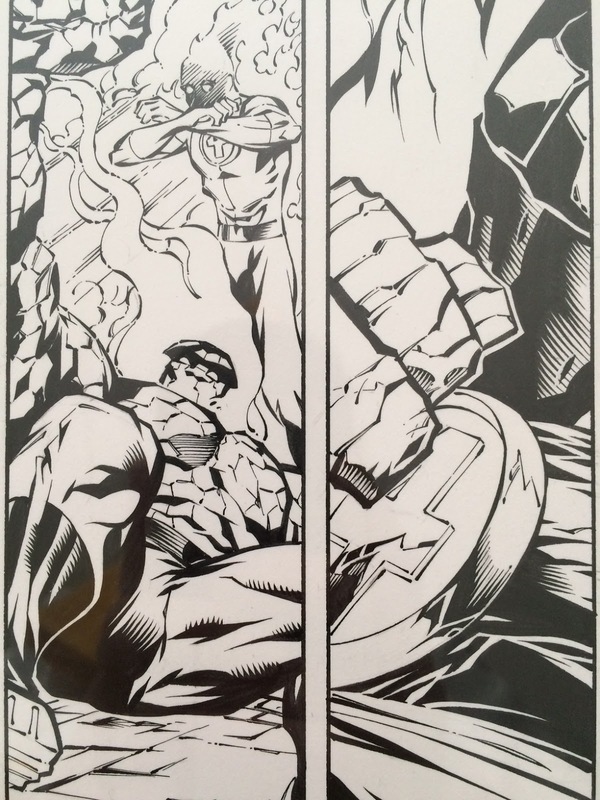 Here we see the Invisible Woman turning invisible for no apparent reason (but I appreciate the effort, Sue). Eaglesham tends to draw a bulky Thing with a smaller head. 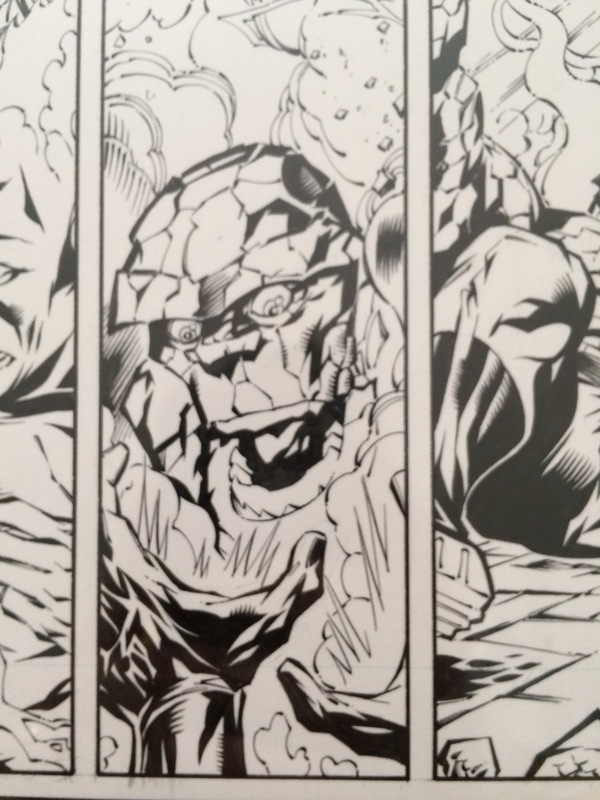 I'm just glad that we get to see all of those rocks and he doesn't cover them up with a giant costume. Draw 'im how Kirby intended! This Reed Richards had the power to grow a huge beard (maybe). 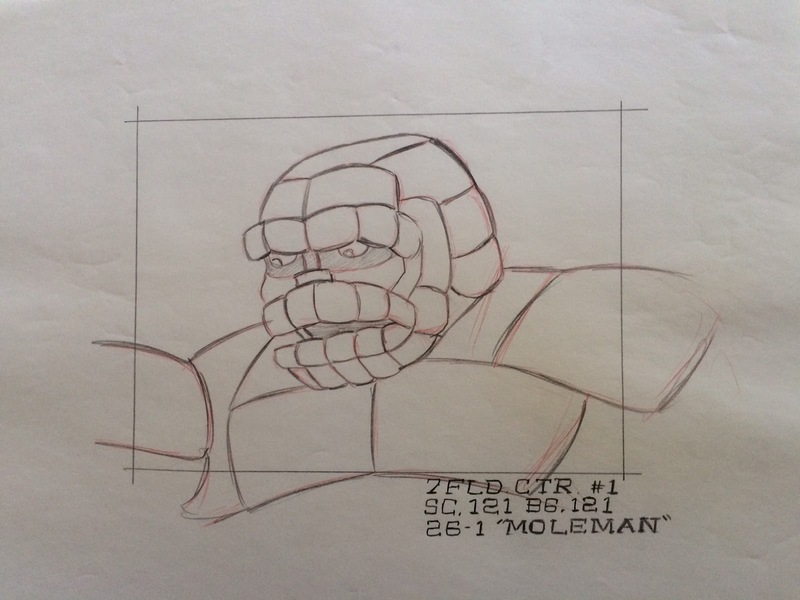 My next group includes some production drawings from the 1967 and 1994 Fantastic Four cartoon! I've been looking for artwork from the very early 1967 show for a while - it turns out that they've been on eBay under a different name (sneak eBay sellers). 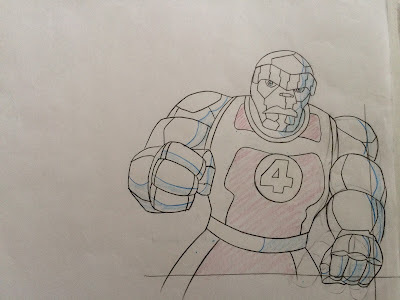 They had a number of production drawings, but I (of course) stuck with the Thing for now. It's such a weird design - different from really any other version of the character. It's very strange and pretty ugly. But I love it for those reasons. 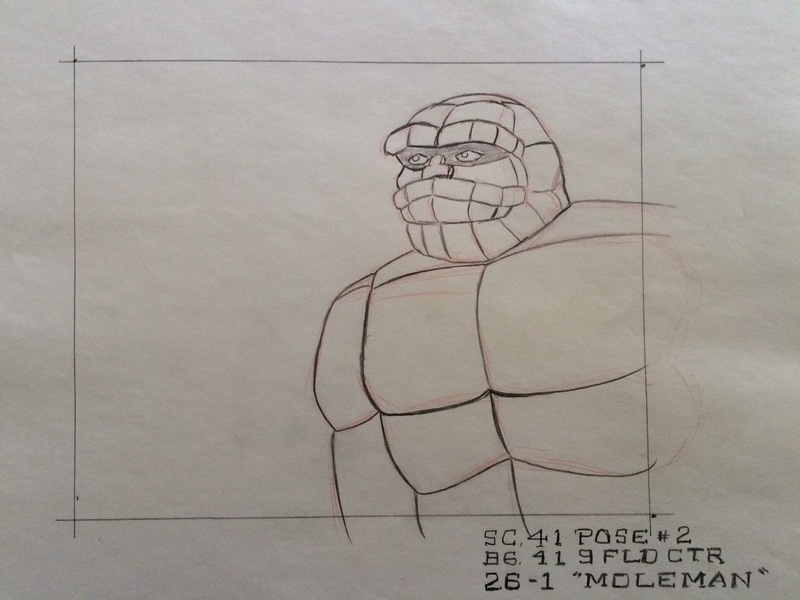 Each of these three drawings came from the "MoleMan" episode. They're in great shape for being nearly 50 years old. And I couldn't resist picking up another from the 1994 series as well. Lastly, I finally managed to add a copy of Fantastic Four #50 to my collection, the final part of the Galactus trilogy. I've now got all three parts! This copy is in decent shape and looks nice next to issues 48 and 49. That's it for now! 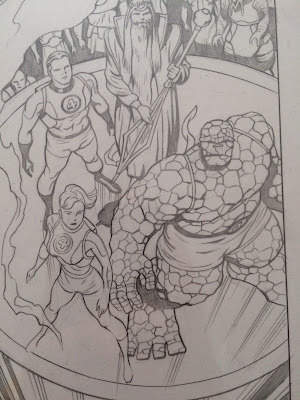 I'll be sure to force you all to see more Fantastic Four items soon. EDIT: This is my 700th post. You're welcome.